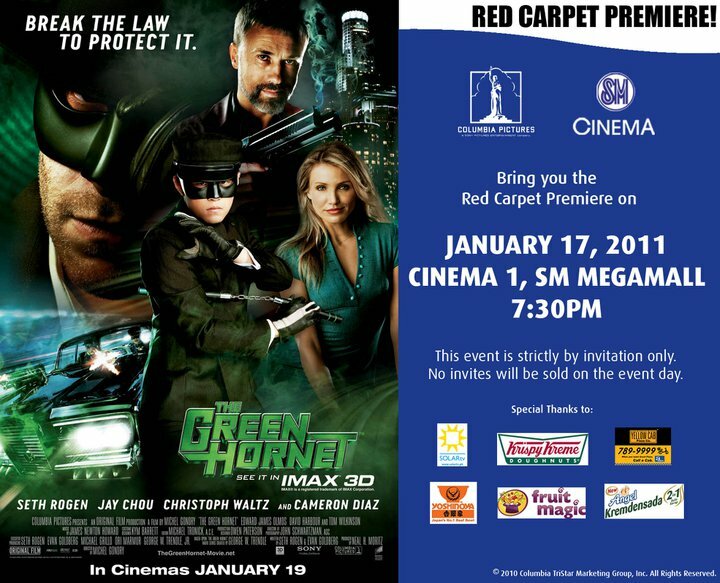 SM Cinema once again hosted an awesome premiere at SM Megamall Cinema 1. On the said event, a red-carpet premier, are sponsors who all helped which made it possible and exciting! Never left my tummy neglected with all those food being given to guests. There is one of my favorite pizza station, Yellow Cab Pizza Co., giving away NY Classic pizza. Nearby is Fruit Magic, with their table armed with blenders and fruits, and sampled Strawberry Banana Shake. I've been actually awaiting to make a dessert from strawberry and yes finally strawberries! Then there's Yoshinoya, giving out choices of beef gyudon, chicken katsudon and chicken teriyaki in take-out bowls. I've always loved Japanese rice bowls before going to movies and have visited a lot of Yoshinoya branches, and my husband and I loved their recipes. Also, ANGEL Kremedensada, took part in the event. I was actually unaware that the fruit salad the Yoshinoya staffs were giving away was from Angel Kremedensada , I thought they have added the dessert in their menu. I haven't actually used that product yet in my cooking, nevertheless the taste and texture of having a condensed milk and cream in one can , can be that glorious. The last but not the least was Krispy Creme's booth. Had to have someone take a picture of me with their limited doughnut creation and a green mask, hehehe. The Original Glazed doughnut hand dipped in smooth bubble gum flavored green and white icing . Jay Chou, as Kato, now my favorite Asian, martial arts hero, who happened to be the Green Hornet's (Britt Reid) side-kick. Kato, also known as the chauffeur, the nameless "super-hero" who makes the best cup of joe who had been the brain in the "xiong di" relationship. "Xiong di" according to him is brother, as what he considers Britt. I like what Britt calls him, "human Swiss Army knife." Well he is so adorable, especially when he sang on their first night roll. I'm not sure if this is true, but I've heard he is also a singer. About the Green Hornet himself though, he is a prick , an overly childish, rich and repressed guy. Torn by his father's view of a failure in him and had eventually came out of his shell, discovering the shadows behind the crime in the city as what had been perplexed in their newspaper company, The Daily Sentinel, and the death of his father. The movie somehow had been over headed with jam-packed technology, action and comic pulp. But this too, shows heart, we really can not mislead ourselves knowing we are always on top, like being rich or famous, at the end of the movie, the tie that had bonded Britt and Kato, saved both their lives and the city. All in all, I spelled the movie in three letters. F - U - N.
Michel Gondry, had put fun in action! Guess what glasses I'm donning, 3D glasses. Yip, sure is ready to enjoy the 3D movie of 2011, starting off with THE GREEN HORNET. Here I am enjoying my share of the green iced sting Krispy Creme doghnuts! So do enjoy the movie at SM 3D Cinemas Nationwide. Click here to get movie and ticketing details. Chocolat (sho-coh-LAH): Why do I Love Thee?